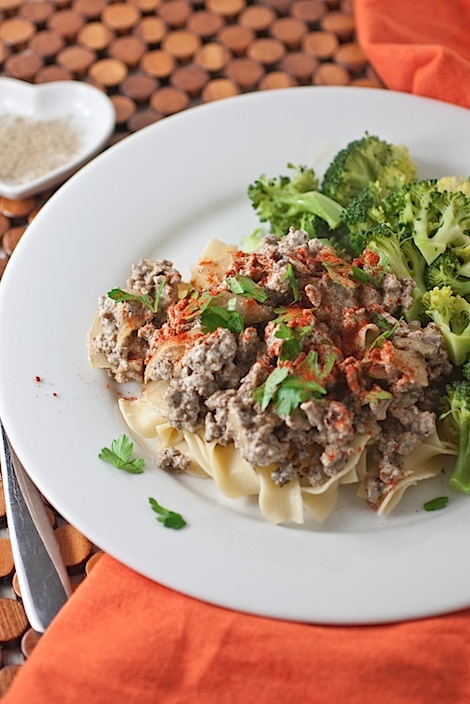 She has cooked many things over the years, but Mom’s Beef Stroganoff Recipe is a true classic in our family. I’ve been enjoying this dish for as long as I can remember. And now, hubby is a fan, too. I’d say Mom’s Beef Stroganoff Recipe has remained the same over the years, but I did try to change it one time when I was about middle school age. Mom always put mushrooms in the dish, and since I wasn’t a fan of them, I often voiced my displeasure. After growing tired of my begging to remove the them, she finally told me one day (somehow very patiently) that she’d make her beef stroganoff sans mushrooms next time. I eagerly awaited the next appearance of beef stroganoff on the dinner table. The next time it was beef stroganoff night, mom tried one last time to talk me into keeping the mushrooms as she began preparing dinner. “It really tastes better with the mushrooms in, honey.” I didn’t believe her. I couldn’t wait to taste the meal without those yucky mushrooms. I just knew it was going to be so much better. She’d see. Once dinner was served, I eagerly dug in. I remember it a bit more animated than I’m sure it actually was. Me smiling like an overly-enthusiastic cartoon with big googley eyes. Fork raised and ready to dig in and then moving in slow motion. Fork to plate…fork to mouth…chew…chew…cheeeeeewwwww? Eyes shrinking…smile slowly disappearing. The slow realization that it tasted like crap. Ok, it didn’t taste like crap, but mom was right…it really did taste better with mushrooms. C’est la via…lesson learned. And to this day, I always include mushrooms. Sometimes, I cut them large so they’re easy to pick out. Sometimes, I mince them so they are practically undetectable. Large or small, obvious or not, the mushrooms are always there. This is probably one of those recipes that was passed around in the 80s by all the cool moms. I’m sure there are similar ones out there, but this is our take. Oh, and if you didn’t read my story earlier in this blog post, be sure to include mushrooms (unless you’re allergic) to get the full taste. I’m not a fan, but I always add them. I like to use cremini, mostly because I enjoy the flavor and you can get them individually at the grocery store, but feel free to substitute your favorite. Anywho, this meal makes an affordable an easy meal that I gravitate towards on my busy weeknights. Pre-heat a large skillet over medium heat. Add beef and cook till browned, about 5 minutes. Skim fat and then add butter, onion, mushrooms, and garlic. Cook till beef is well browned and onions are translucent, stirring often, about 5-7 minutes. Add water, sherry, lemon juice, bouillon cube(s). Cook till all the liquid is gone, stirring frequently. Mom’s tip: be sure to wait till all the liquid is gone before moving to the next step or the sauce will be too liquidy. Turn off heat, add sour cream, and stir till well combined. Serve over pasta or rice. Top with parsley and paprika, if using. Serve with a vegetable, too – I like steamed broccoli with a drizzle of melted butter. Hope you enjoy My Mom’s Beef Stroganoff recipe as much as my family has. Happy cooking! Reader question: What classic recipes did you grow up eating? 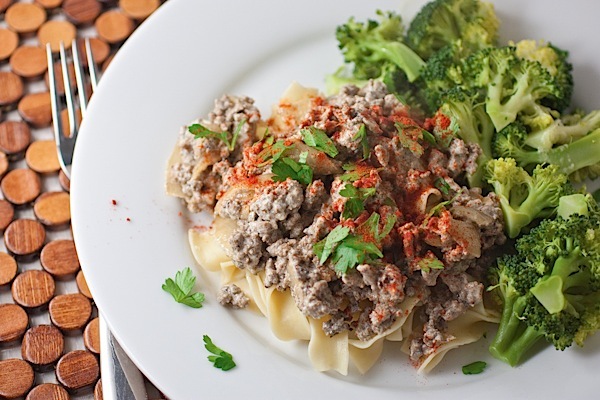 Funny, your mom’s stroganoff is totally different from the one my mom and I used to make. First, we used turkey breasts that we cut into bite-sized stripes, we prefered a thinner sauce (and lots of it! ), and we added sliced pickles and a pinch of mild red pepper powder. I have a series on my blog called ‘German classics’ where I post (vegetarian versions of) my childhood favorites. As a kid, I really loved pancake soup. Sounds strange, but it’s very tasty! Oh, that reminds me that I need to post my grandma’s raisin blini recipe. I haven’t made them in ages! mmm growing up, my grandma’s beef stroganoff was my favorite meal! 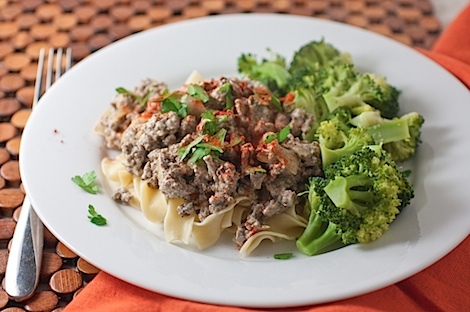 she used strips of beef instead of ground beef but otherwise sounds similar to your family recipe. now you have me craving it! My mom used to make this all the time as well 🙂 I did not eat meat as a child either, but I bet my kids would love it! Stroggy with ground beef is a new one of me. It has to be strips of a good steak. Have to say I don’t eat ground meat anyway so I won’t be trying your recipe, but loved the story. I am unable to eat mushrooms. And yes they do have to be included, but I just eat around them LOL.